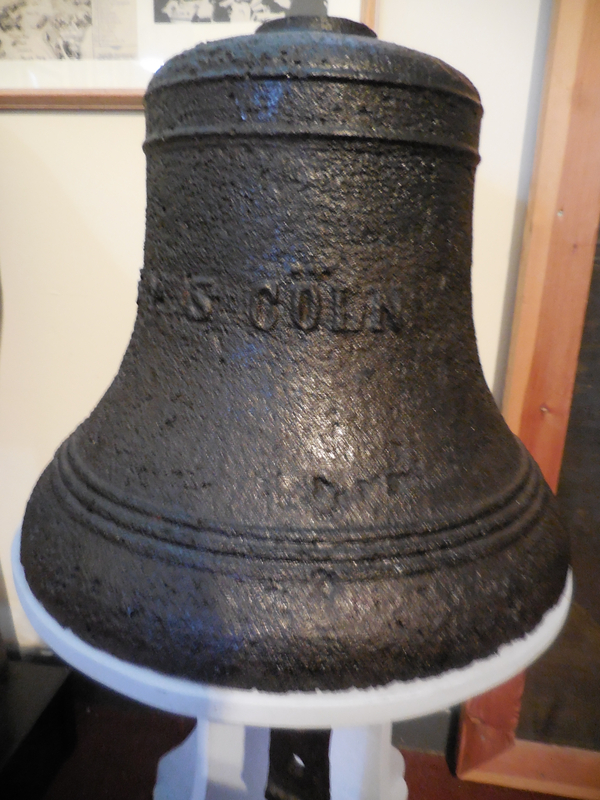 Over the last few years, I have tried to locate as many of the bells salvaged from Scapa Flow. 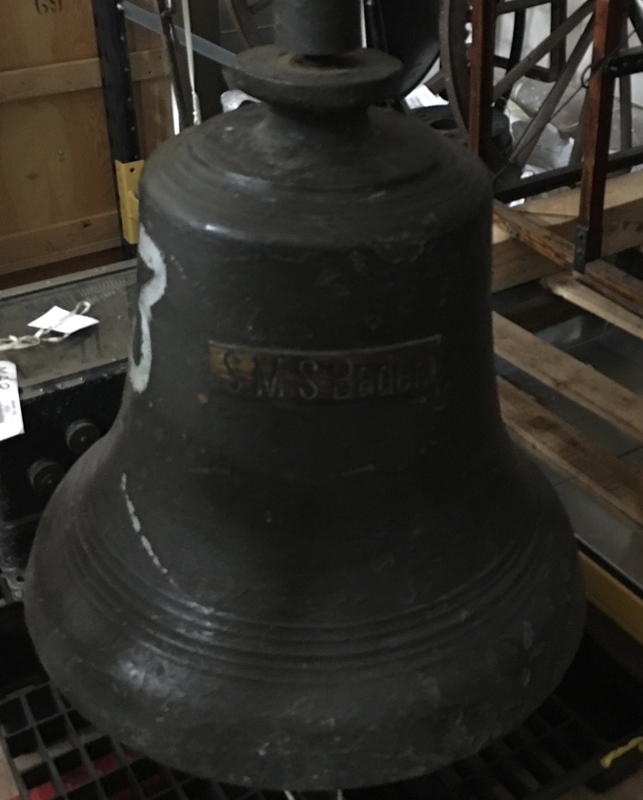 Originally, the idea was to bring the bells back on June 21 2019 to be rung again over the Flow. While that proved to be too expensive, one will come back on the day. Where I could I have made sound recordings. Looking for the bells became a journey. Along the way, I made many new friends and discovered some wonderful stories. Here are some of them. 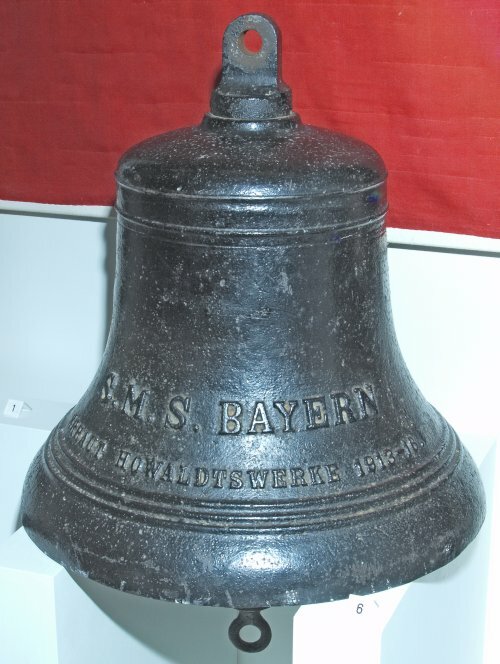 Originally the bell of the SMS König Albert was rumoured to be in a Scottish house. It was. Until it came south with Robert McCrone’s youngest grand-daughter, Helena. 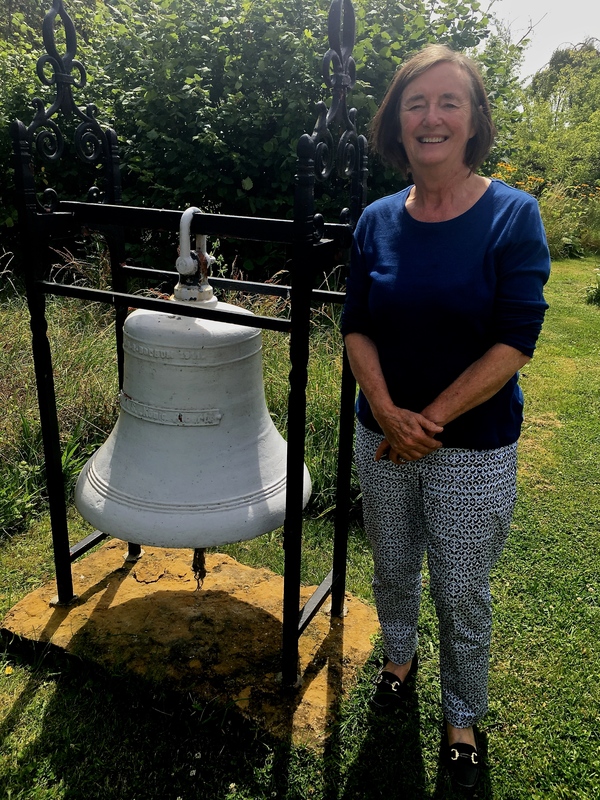 The ship’s bell now hangs in her garden in Somerset. The Bayern‘s bell is to be found in the collections of the Bavarian Military Museum (Bayerisches Armeemuseum). 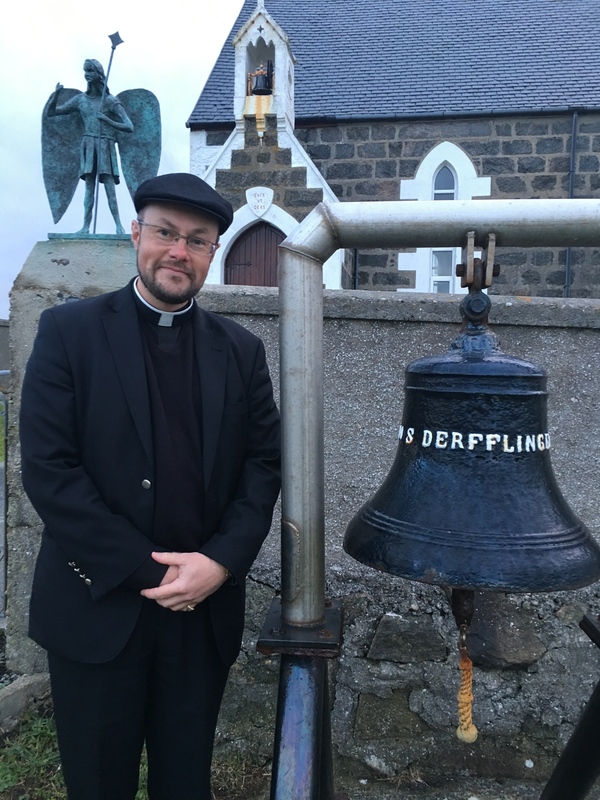 When the Lyness visitor centre re-opens in 2020, one of the artefacts you’ll be able to see is the bell from the light cruiser, SMS Cöln. Sadly. the bell has been damaged so much that the only sound you get is a dull thud. In 2017, I visited the small Hebredian island of Eriskay, on the west coast of Scotland. Eriskay is a magical place. It’s where Bonnie Prince Charlie stepped back on to Scottish soil in July 1745. The photos online did not match the magic. 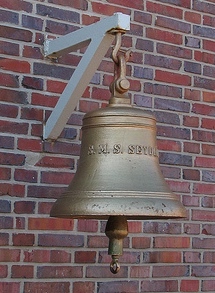 The ship’s bell hangs outside on a scaffolding-like rig. 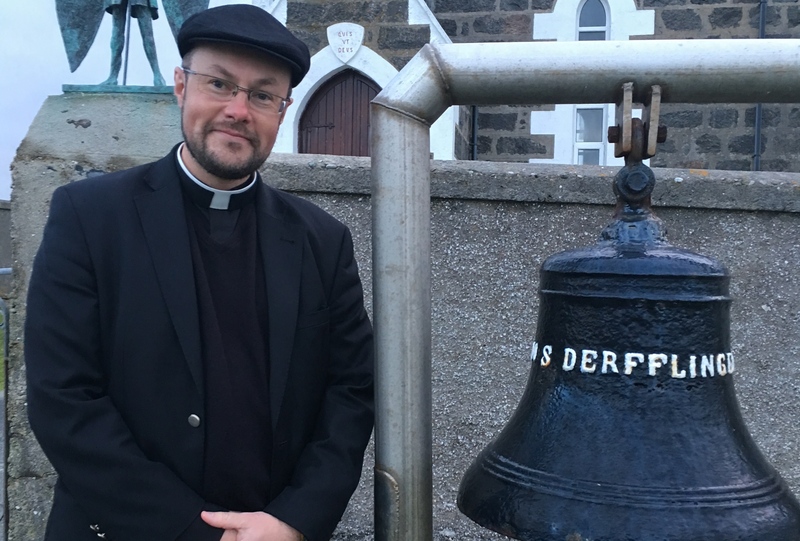 I met with the new parish priest, Father Ross, who had invited me to come and visit. Together, we stood outside trying to coax some chimes out of the bell. It turned out to be a lost cause. The bell was both damaged and the wind was howling. The journey, however, wan’t. The church looks out on the skerries where the SS Politician had foundered, spilling its precious cargo of whisky. Compton McKenzie turned the tale into the wonderful saga, Whisky Galore. I think the search will continue. 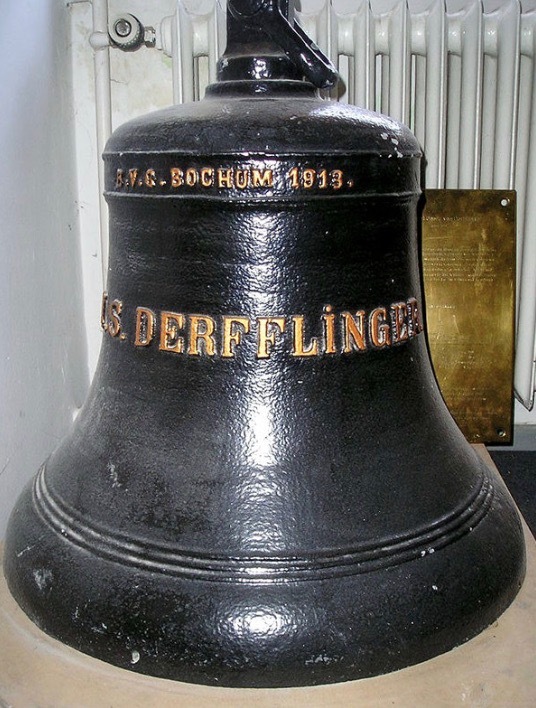 One web article reported that at least one of Derfflinger‘s bells was handed back to the Federal German Navy (FGN) on 30 August 1965. 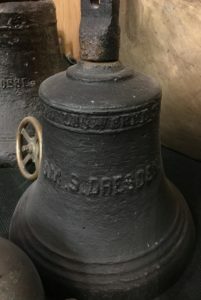 At the handover ceremony (when the bell from Friedrich der Große was also given back to the German Navy) was Mackenzie from Metal Industries. 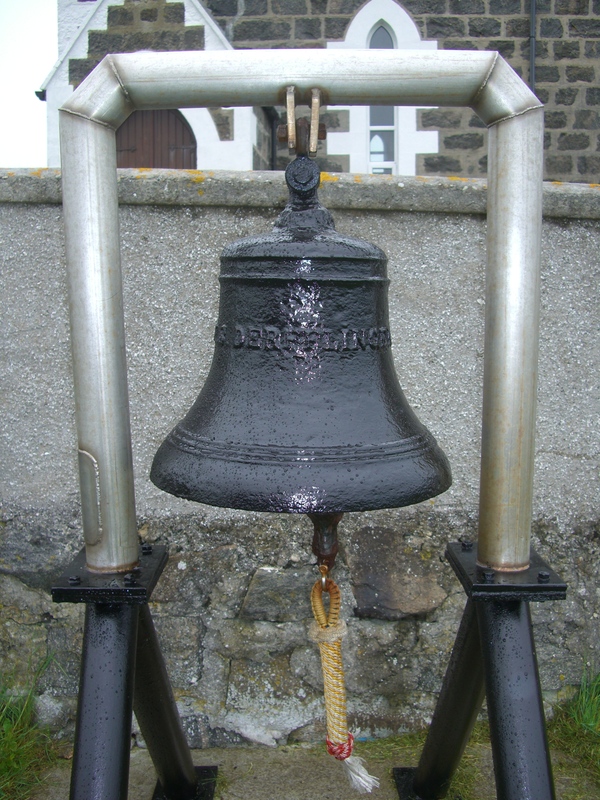 The bells were accepted by Korvettenkapitän Steffan of the school ship, Scheer. 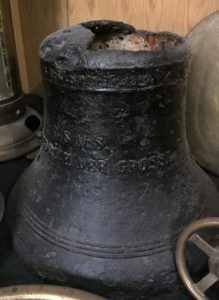 The photograph presents a bell that looks to be in beautiful condition. 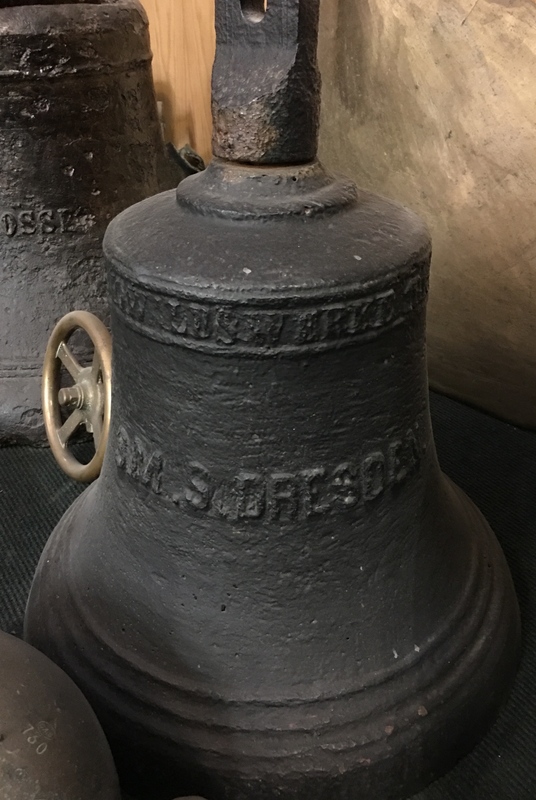 The bell is now in the collection of the Stromness Museum on Orkney, sitting beside the broken bell of the former Fleet flagship, the SMS Friedrich der Große. SMS Kronprinz started life as that and only became SMS Kronprinz Wilhelm in March 1918. Courtesy of Dr. Innes McCartney. 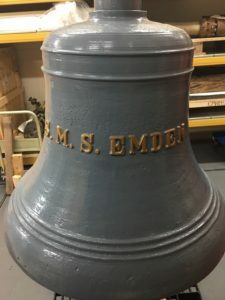 Von Reuter’s flagship’s bell from the Emden is stored at the Imperial War Museum at Duxford. 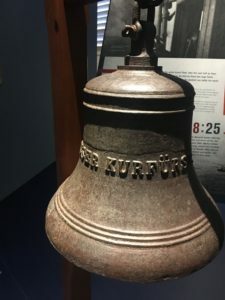 It would be wonderful if this was the bell that could be rung on the Flow in 2019. There are two bells from the former fleet flagship, Friedrich der Große. One, heavily damaged, is at the small museum in Stromness. How it got there, no one quite know. It was found and brought up from the Flowby local diver, John Thornton, who originally gave it to the local hotel. 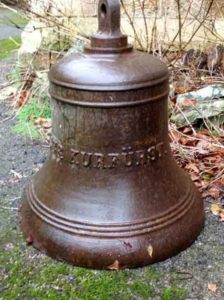 I tracked SMS Große Kurfürst‘s bell an auction that was held at the church hall of St.Andrew’s United Reform church in Southampton in 2014. But I could not get any further; the buyer remained a mystery. It turned out that the National Museum of the Royal Navy had been the purchaser. 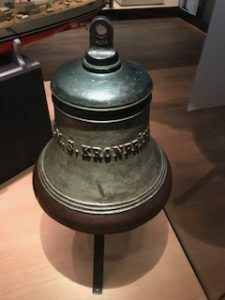 In 2018, when the bell emerged from storage to be included in the Jutland 36 Hours exhibition for its last few months, I was very kindly allowed to record its chime. 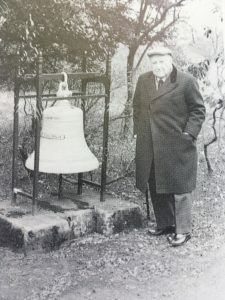 One of Hindenburg‘s bells was presented to the FGN in 1959, on 28 May. 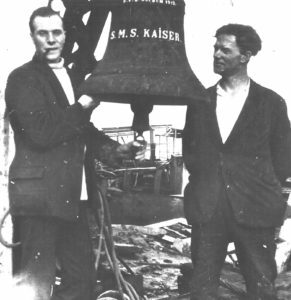 There was evidence that the bell from SMS Kaiser had survived the scuttle. 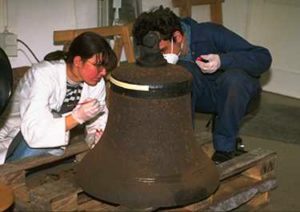 Some photos of the bell being restored were posted online. 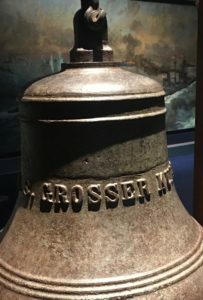 The bell is now displayed at Peter Tamm’s museum, the International Maritime Museum in Hamburg. 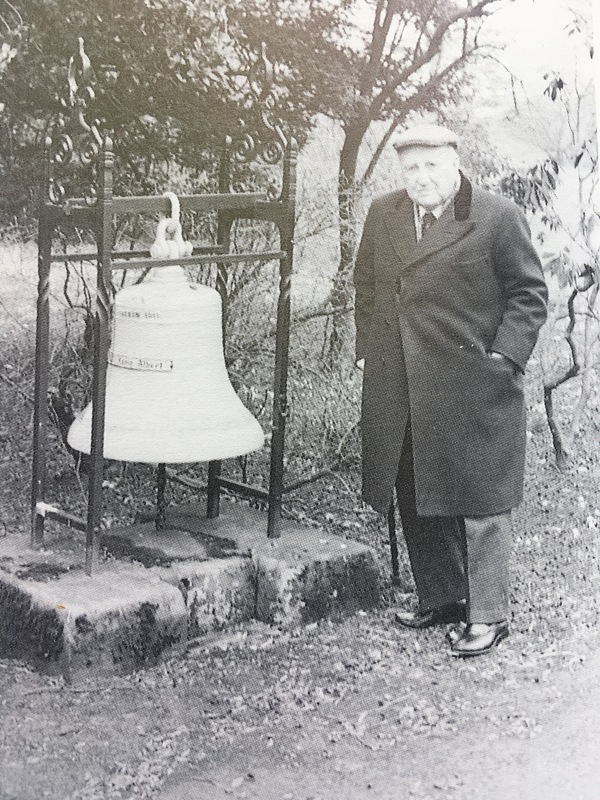 The bell still eludes discovery. It was supposedly brought up by an RAF dive team on 16 June 1974 and a report of the expedition still exists. 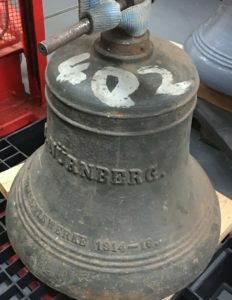 Nürnberg‘s bell, along with that of the second Emden and one of Hindenburg‘s bells, is kept at the Imperial War Museum’s Duxford storage site. Each May 31st, the Seydlitz bell is rung in the courtyard of Laboe at what used to be the Submarine Memorial and is now the memorial to all lost at sea. 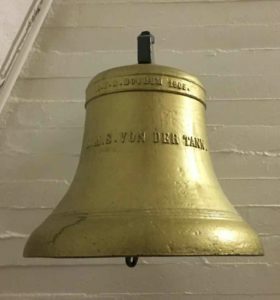 Here, with von der Tann‘s bell, it is looked after by the German Naval Association.